A down economy is the perfect time to evaluate production efficiencies, or lack thereof. A thorough examination of pressworking operations may indicate that hydraulic-press technology is more efficient for certain applications than are mechanical presses. Hydraulic presses handle a range of applications, broadening opportunities for more business, and offer metalformers a number of unique benefits. Today’s hydraulic presses, faster and more reliable than ever, feature significant technology upgrades. Improvements in seals, more efficient pumps, and stronger hoses and couplings have virtually eliminated leaks and minimized maintenance. 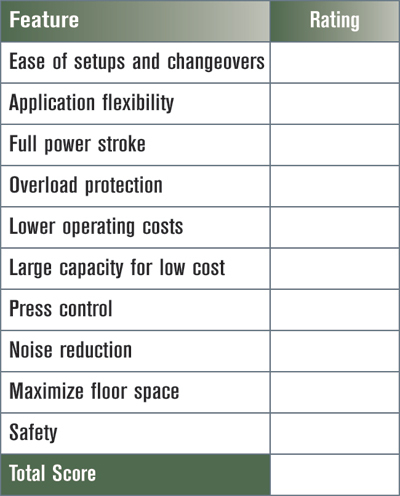 Check out these Top Ten benefits of hydraulic presses and then complete the hydraulic features rating. Perhaps you’ll find that it’s time to get serious about going hydraulic. Hydraulic presses save time during setup and changeovers. Delivery of full power at any point in the stroke negates the need to determine the exact location of maximum tonnage. Thus, hydraulic presses eliminate the tricky, time-consuming task of setting the stroke on a mechanical press, enabling more rapid job changeovers. Hydraulic presses have become increasingly common on high-volume production lines. A single hydraulic press can perform a variety of jobs within its tonnage range. Common applications include deep drawing, shell reduction, urethane bulging, forming, blanking and piercing, staking, punching, press fitting, straightening and assembling. 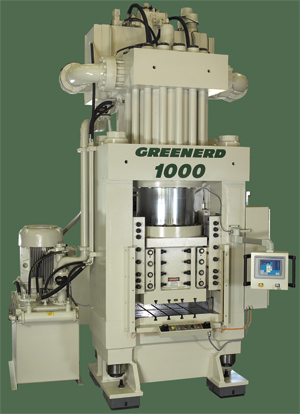 Manufacturers also employ hydraulic presses for powdered-metal forming, abrasive-wheel forming, bonding, broaching, ball sizing, plastic and rubber compression, and transfer molding. Programmable logic controllers and other electronic controls have improved speed and flexibility. With new computer interfaces and monitoring, hydraulic presses find wide use in advanced computer-integrated manufacturing systems. Hydraulic presses perform the jobs listed below, and hundreds of others. • Electric-motor manufacturers assemble motor shafts to rotors, compress laminations and press cores into housings. • Automotive manufacturers press tiny shafts into water pumps, assemble shock absorbers, blank and form diaphragms, and stake disc brakes together. • Jewelers coin Boy Scout pins. • Aerospace companies form tough titanium housings. • Huge forming presses shape tuba bells and cymbals. • Presses straighten hardened road-grader blades and machine s.
• Hollowware manufacturers blank and draw brass bowls automatically from coiled stock. • Equipment presses computer-disc shafts into precision bearings. The full power of a hydraulic press can be delivered at any point in the stroke. That means not having to buy a 200-ton-capacity press to achieve 100 tons of force throughout the stroke. Other advantages include faster setups and no time-consuming adjustment of the stroke nut on the slide to accommodate different dies. Hydraulic presses provide built-in overload protection. For example, a 100-ton hydraulic press will exert only the specified tonnage—100 tons pressure if set for 100 tons, or less if set for less—no matter what mistakes are made during setup. This eliminates worries about overloading, or damaging the press or die. When a hydraulic press reaches its set pressure, a relief valve opens to ensure that no additional pressure is created and there is no danger of overload. Built-in overload protection also applies to the tooling. Tooling built to withstand a certain load is in no danger of damage due to overloading—tools can be sized to withstand the load of a particular job, not a particular press. The pressure of the press can be lowered to suit the job, and the lack of impact, shock and vibration promotes longer tool life. 10 and 30, then perhaps you're doing fine with your mechanical presses for now. 31 and 50, then you might want to start gathering some data on ongoing hydraulic. 51 and 70, then you should think about moving to hydraulic presses. 70+, it's time to get serious about gonig hydraulic. Evaluate your needs and start talking to hydraulic-press manufacturers. Relatively simple design means that hydraulic presses can provide a significant cost advantage over mechanical presses in comparable sizes. Moving parts, few in number, remain fully lubricated in a flow of pressurized oil, and breakdowns are infrequent and usually minor. Typical routine maintenance tasks include replacement of packing, solenoid coils and, occassionally, a valve. These inexpensive parts are easily replaced without disassembling the entire machine, increasing uptime and decreasing maintenance costs. Metalformers can inexpensively purchase certain capacities in hydraulic presses. Stroke lengths of 12, 18 and 24 in. are common with extra stroke length provided relatively easily. Daylight, too, can be added without much additional cost. Hydraulic-press purchasers also can choose larger table areas and small presses with big bed areas—large 200-ton presses with relatively small beds are available as press tonnage does not dictate bed size. With a hydraulic press, ram force, direction and speed, the release of force, and the duration of pressure dwell can be adjusted to fit a particular job. Jobs with light dies can be performed with reduced pressure—the ram can approach the work rapidly, then shift to a slower speed before contact, prolonging tool life. Timers, feeders, heaters, coolers and a variety of auxiliary functions can be brought into the sequence to suit the job. Fewer moving parts and elimination of a flywheel reduce the overall noise level of hydraulic presses as compared to mechanical presses. Properly sized and mounted pumping units meet and exceed current federal standards for noise, even with the pumps under full pressure. Due to control of each phase of ram movement, noise levels also can be controlled—a hydraulic ram can be programmed to pass through the work slowly and quietly. 3 ft. wide. At 10 times the capacity, the 200-ton press only takes up 50 percent more room, optimizing pressroom floorspace. Information for this article provided by Greenerd Press & Machine Co., Inc., Nashua, NH. Tel. 603/889-4101; www.greenerd.com.